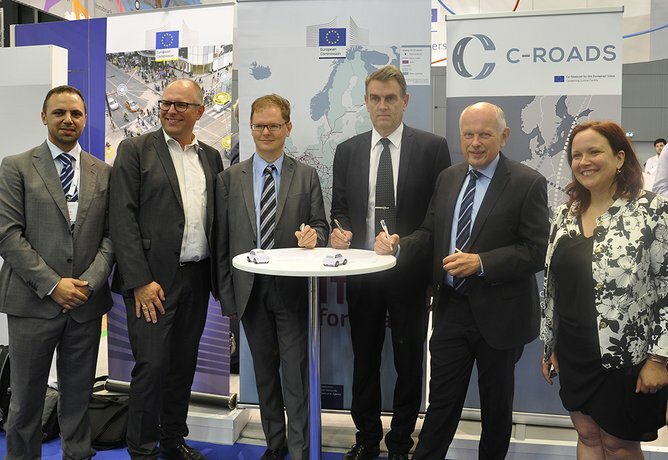 The CAR 2 CAR Communication Consortium and the C-Roads Platform have just signed a Memorandum of Understanding for enabling a close cooperation between the automotive industry, road authorities, and road operators for preparing the deployment of initial cooperative ITS services across Europe by 2019. Short-range wireless communication from Vehicle to Vehicle (V2V) and Vehicle to Infrastructure (V2I) – based on the ITS-G5 standard (IEEE 802.11p) – represents together with hybrid communication technologies an essential cornerstone towards safe connected automated driving. Both partners strongly support the recommendation developed by the European Commission’s C-ITS Deployment Platform to utilise short range communication in the 5.9 GHz frequency band. In accordance with the European C-ITS strategy (COM (2016) 766) adopted in November 2016, the hybrid communication approach builds on combining short-range ITS-G5 and wide area cellular and broadcast communication under a complementary principle. Interoperability of C-ITS services is a pre-requisite for enabling seamless driver experience while travelling cross-border on European roads. Vehicles need to understand and correctly process messages sent by each other – irrespective of the brands – as well as by the road operators for enabling the best-possible support of the drivers in each individual traffic situation. Initiatives to achieve this requirement are broadly facilitated by the European Commission and gain additional importance with increasing automation of the vehicles. Since its foundation in 2002, the CAR 2 CAR Communication Consortium focused its work on establishing European standards for short range communication between vehicles and traffic infrastructure. The allocation of the 5.9 GHz band for these purposes has mainly been driven by the Consortium. Its members have initiated and supported numerous research projects as well as large-scale field operational tests on national and European level. As a result of this, ITS-G5 has proven to be ready for enabling short-range communication. Now that the systems enter the deployment phase, the Consortium is working closely together with infrastructure deployment initiatives to ensure a seamless market introduction of V2I communication. In 2016 the C-Roads Platform has been established as the platform of Member State authorities and road operators for harmonising the roadside C-ITS deployment across Europe. As infrastructure deployment initiatives are growing in number, the CAR 2 CAR Communication Consortium commits to close collaboration with the C-Roads Platform for jointly fostering the successful C-ITS deployment in Europe starting in 2019. With the signing of this memorandum, major European stakeholders are displaying initiative by moving closer together and emphasising their commitment to the common goal of harmonising C-ITS deployment across borders and throughout Europe. Enhancing road safety and traffic efficiency by means of Cooperative Intelligent Transport Systems and Services (C-ITS) is the dedicated goal of the CAR 2 CAR Communication Consortium. The industrial driven, non-commercial association was founded in 2002 by vehicle manufacturers affiliated with the idea of cooperative road traffic based on Vehicle-to-Vehicle Communications (V2V)and supported by Vehicle-to-Infrastructure Communications (V2I). Today, the Consortium comprises 88 members, with 18 vehicle manufacturers, 39 equipment suppliers and 31 research organisations. The C-Roads Platform is a joint initiative of European Member States and road operators which are in the phase of deploying C-ITS for testing and later operation. Pilot installations will be harmonised across borders, ensuring interoperability based on cooperation within the C-Roads Platform. Key elements are the joint development of technical specifications that will provide the basis for all pilot deployments, as well as the common cross-site testing to achieve interoperability of the deployed C-ITS services. Develop system tests based on the common communication profiles by focusing on a hybrid communication mix, which is a combination of ETSI ITS-G5 and operational cellular networks.